We have recently shown that the G protein-coupled receptor 142 (GPR142) is expressed in both rodent and human pancreatic β-cells. Herein, we investigated the cellular distribution of GPR142 within islets and the effects of selective agonists of GPR142 on glucose-stimulated insulin secretion (GSIS) in the mouse islets and INS-1832/13 cells. Double-immunostaining revealed that GPR142 immunoreactivity in islets mainly occurs in insulin-positive cells. Potentiation of GSIS by GPR142 activation was accompanied by increased cAMP content in INS-1832/13 cells. 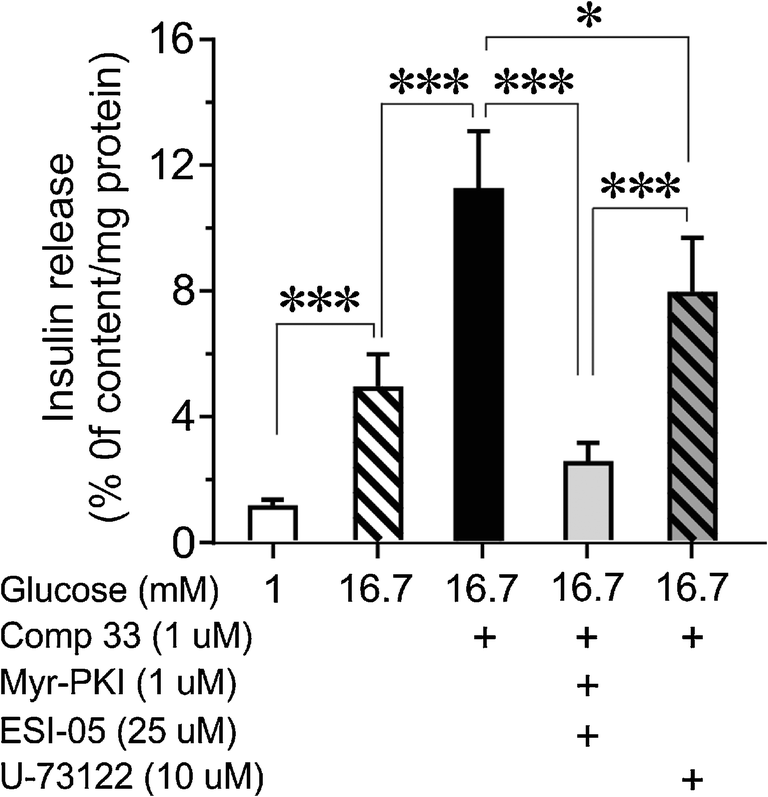 PKA/Epac inhibition markedly suppressed the effect of GPR142 activation on insulin release. Gpr142 knockdown (Gpr142-KD) in islets was accompanied by elevated release of MCP-1, IFNγ, and TNFα during culture period and abolished the modulatory effect of GPR142 activation on the GSIS. 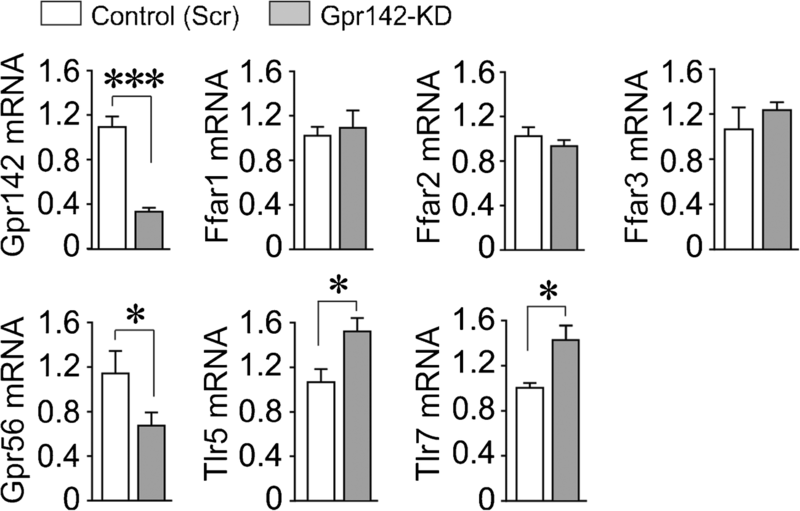 Gpr142-KD had no effect on Ffar1, Ffar2, or Ffar3 mRNA while reducing Gpr56 and increasing Tlr5 and Tlr7 mRNA expression. Gpr142-KD was associated with an increased expression of Chrebp, Txnip, RhoA, and mitochondrial Vdac1 concomitant with a reduced Pdx1, Pax6, and mitochondrial Vdac2 mRNA levels. Long-term exposure of INS-1832/13 cells to hyperglycemia reduced Gpr142 and Vdac2 while increased Chrebp, Txnip, and Vdac1 mRNA expression. GPR142 agonists or Bt2-cAMP counteracted this effect. Glucotoxicity-induced decrease of cell viability in Gpr142-KD INS-1 cells was not affected by GPR142-agonists while Bt2-cAMP prevented it. The results show the importance of Gpr142 in the maintenance of pancreatic β-cell function in rodents and that GPR142 agonists potentiate GSIS by an action, which most likely is due to increased cellular generation of second messenger molecule cAMP. The online version of this article ( https://doi.org/10.1007/s00424-019-02262-7) contains supplementary material, which is available to authorized users. A tightly regulated blood glucose level with very narrow fluctuations is paramount to achieve optimal cell function in the body . Although there are several hormones that increase blood glucose, insulin secreted by pancreatic β-cells is the only hormone capable of decreasing blood glucose by increasing glucose uptake by peripheral tissues . Insulin secretion by the pancreatic β-cell is regulated through various metabolic, hormonal and neural factors [26, 28]. The secreted insulin in turn, regulates many metabolic aspects of importance to the body. Thus, dysregulated β-cell function would contribute to development of the metabolic syndrome. Disturbed metabolic conditions with accelerated and sustained hyperglycemia further negatively modulate pancreatic β-cell function, ultimately resulting in the development of Type 2 diabetes (T2D) [26, 28, 39]. The incident of obesity and T2D are increasing rapidly around the world, independent of ethnicity and conventional antidiabetic agents and treatment strategies are failing to preserve insulin-producing β-cells. Since functional β-cells are very essential in the prevention of T2D new approaches aim to preserve β-cell functionality, by targeting specific GPCRs with positive impacts on the β-cell as subsequent diabetes therapies, have gathered tremendous interest. GPCRs regulate a myriad of physiological and pathophysiological signaling processes in the body and constitute a rich source of targets for the pharmacological prevention of various human diseases including T2D [5, 37]. The majorities of GPCRs expressed in the pancreatic islets is still “orphan” with poorly characterized function and/or still with no identified ligands and have not been utilized as possible antidiabetic targets [2, 4]. Obviously, a low number of the functionally characterized GPCRs in the body are the targets of more than 30% of all modern drugs, which emphasizes the importance of remaining GPCRs currently not functionally mapped in this regard. This could offer novel approaches to treat a number of human diseases including the metabolic syndrome and diabetes. We have recently identified all GPCRs expressed by pancreatic islet cells [2, 4]. Based on the published results during recent years, it has become apparent that these GPCRs have a great impact on islet cell function and might be suitable drug targets to influence insulin secretory events and islet cell survival in a positive manner. The aim of the present study was to investigate the cellular localization and the functional impact of the previously deorphanized Gpr142 (L-tryptophan/L-phenylalanine receptor) on cAMP generation in mouse pancreatic islets β-cell. The effect of cAMP on secretory process is mediated by two ubiquitously important signaling proteins, i.e., protein kinase A (PKA) and exchange protein activated by cAMP (Epac) . Since PKA and Epac may act independently or converge synergistically in regulating a specific part of insulin secretory processes, we used two specific blockers of these two proteins to investigate the impact of Gpr142 on the insulin secretion. For comparisons, the effect of phospholipase C (PLC) inhibitor on Gpr142 evoked insulin release was also studied. Attempts were also implemented to study the impact of Gpr142 on the expression of a number of down-stream signaling molecules of importance for the β-cell dysfunction. For this purpose, we used two newly developed small molecule agonists for GPR142 with higher magnitude of selectivity and potency compared to naturally occurring endogenous ligands L-tryptophan and L-phenylalanine (Supplementary Fig. 1) [19, 34]. Collagenase (IV) was bought from Sigma St. Louis, MO, USA, and fatty acid free bovine serum albumin (BSA) from Boehringer Mannheim, Germany. Polyclonal rabbit anti-GPR142, was from LSBio (LS-C383759) (Seattle, WA, USA), guinea pig-raised anti-insulin antibody (Cat# 16049) (Progen), mouse monoclonal anti-glucagon antibody (Cat# ab10988) (Abcam), mouse monoclonal anti-somatostatin antibody (ab140665)(Abcam), and monoclonal mouse anti-VDAC1 (AB_2564843) (Calbiochem). Cy2-conjugated anti-mouse IgG (715-165-151) and Cy5-conjugated anti-guinea pig (Cat# 706-225-148) were from Jackson Immunoresearch Laboratories Inc. (West Grove, PA, USA). The qPCR primers used were from Applied Biosystems (see below for the ID-numbers). Compound 33 and compound A were kindly donated by Lilly. The insulin ELISA kit was from Mercodia (Sweden). Myr-PKI (Cat# 2546) was from Tocris, ESI-05 (Cat# M092-05) was from Biolog Life Science and all other chemicals were from Merck AG, (Darmstadt, Germany) or Sigma-Aldrich (USA). The content of Krebs-Ringer bicarbonate buffer (KRB) used for incubation of islets was (in mM): NaCl (120), KCl (4.7), CaCl2 (2.5), KH2P O4 (1.2), MgSO4 (1.2), HEPES (10), NaHCO3 (25), and 0.1% fatty acid free bovine serum albumin and the pH was adjusted to 7.4. The secretion assay buffer used for INS-1 cell experiments was also a HEPES balanced salt solution (HBSS) containing (in mM): NaCl (114), KCl (4.7), KH2P O4 (1.2), MgSO4 (1.16), HEPES (20), CaCl2 (2.5), NaHCO3 (25.5), pH was adjusted to 7.2 and thereafter supplemented with 0.2% fatty acid free bovine serum albumin. All mice used for preparation of pancreatic islets were sacrificed by cervical dislocation. After a midline incision, the major duodenal papilla was identified. A hemostatic clamp was placed on either side of the duodenal papilla, located precisely where the bile duct drains allowing free passage for the solution to enter the pancreas via duodenal papilla. Preparation of pancreatic islets was carried out by retrograde injection of 1.5 ml of a collagenase solution (1 mg/ml) via the bile-pancreatic duct. The pancreas was, then carefully dissected from surrounding tissues, placed in a 50 ml vial, and incubated at 37 °C for 16 min. Thereafter 40 ml ice-cold Hank’s buffer solution was added and the vial was vigorously shaken to separate the islets from acinar tissues. The content of the vial was transferred to a petri-dish and the islets were handpicked (using laboratory pipette) under stereomicroscope at room temperature. Rat glucose-responding insulinoma cell line INS-1832/13 was kindly provided by Dr. Chrisopher B. Newgard; Duke University, School of Medicine . The INS-1832/13 cells were kept in a complete RPMI 1640 medium with 11.1 mM D-glucose supplemented with 10% fetal bovine serum (FBS), 2% INS-1 supplement, 5 ml penicillin/streptomycin (10,000 U/10 mg/ml), and 10 mM Hepes (HyClone, UT, USA). They were cultured in a humidified atmosphere with 5% CO2 at 37 °C. For the Gpr142 knockdown (Gpr142-KD) experiments, the INS-1832/13 cells were seeded (350,000 cells/well) in a 24-well plate with 1 ml/well complete RPMI 1640 medium without antibiotics a day before transfection (siRNAs). The same complete RPMI 1640 medium without antibiotics was also used during siRNAs treatment. The final transfection volume was 500 ul/well containing 45 nM of Gpr142 siRNAs in Opti-MEM reduced serum media and 1.5 μl of Lipofectamine RNAiMAX (Life Technologies, CA, USA). The siRNAs (Gpr142-KD) treatment was continued for 48 h (including the recovery period of 6 h where the medium was changed to a complete culture medium with antibiotics). The cells reached 90–95% confluence at 48 h post-transfection, thereafter they were washed with PBS before being subjected to different experimental procedure (see below). mRNA from INS-1832/13 cells were extracted using RNeasy® Plus Mini kit (QIAGEN) according to the manufacturer’s instructions. The mRNA quantity was measured by NanoDrop 1000 (NanoDrop Technologies). Thereafter, mRNA was reverse transcribed to cDNA using the RevertAid cDNA synthesis kit (Thermo Scientific). mRNA expression, for the investigated gene, was assessed by quantitative RT-PCR performed on a ViiA System 7 (Applied Biosystems), using TaqMan® Reagents and comparative Ct (∆∆Ct) on a 384-well plate. The expression of target gene was then, normalized to three housekeeping genes Hprt1, Gapdh and Ppia. The primer efficiency (E) values  for investigated gene were in the range of 1.85–2.15 and template cDNAs were diluted in such a way that all quantified genes returned Ct values < 30. The primer-ID numbers were as follows: Gpr142 (Rn02101008_s1); Hprt1 (Rn01527840_m1); Gapdh (Rn01775763_g1); Ppia (Rn00690933_m1); Chrebp (Rn00591943_m1); Txnip (Rn01533891_g1); Ffar1 (Gpr40) (Rn00824686_s1); Ffar2 (Gpr43) (Rn02345824_s1); Ffar3 (Gpr41) (Rn01457614_g1); Gpr56 (Rn01244731_g1); Tlr5 (Rn04219239_s1); Tlr7 (Rn01771083_s1); Pax6 (Rn00689608_m1); Pdx1 (Rn00755591_m1); NFkB (Rn00595794_m1); Nos1 (nNOS) (Rn00583793_m1); Nos2 (iNOS) (Rn00561646_m1); RhoA (Rn00589172_m1); Vdac1 (Rn00821325_g1); Vdac2 (Rn00755819_m1). The proportions of Gpr142 in insulin, glucagon and somatostatin-positive cells in mouse islets were automatically determined by confocal microscopy using the Zen 2009 (Carl Zeiss, Oberkochen, Germany) software using a rabbit Gpr142 antibody (see Chemicals) at a 1:200 dilution. The specificity of the GPR142 antibody toward binding the target receptor protein, i.e., Gpr142, was tested in a Gpr142-knockout cell system, which clearly confirmed the selectivity of the antibody against Gpr142 without any major cross-reactivity with other cell surface proteins (supplementary Fig. 2). For staining of insulin, guinea pig anti-insulin (1:300), for glucagon, mouse anti-glucagon (1:250), for somatostatin, mouse monoclonal anti-somatostatin (1:250) and for Vdac1, mouse anti-Vdac1 (1:200) followed by treatment with fluorescent-conjugated secondary antibodies (1:100) were used (antibodies ID is described under Chemicals). Fluorescence was visualized with a Zeiss LSM510 confocal microscope by sequentially scanning at (excitation/emission) 488/505–530 nm (Cy2) and 633/> 650 nm (Cy5) where the objective was × 20, NA (0.6). The normally low pinhole was adjusted to the signal intensity of the samples on the day of analysis and was kept constant during imaging for all the investigated islets. Co-localization analysis of islet Gpr142 with insulin (indicator of β-cells), with glucagon (indicator of α-cells) or with somatostatin (indicator of in δ-cells) in islets was performed using a ZEN2009 software based on Pearson’s coefficient analysis which recognizes the co-localized pair by comparison pixel by pixel intensity . Data are presented as percentage of Gpr142 positive pixel showing either of other hormones. INS-1832/13 cells were incubated at 1 (1G) or 16.7 mM glucose and 16.7G ± indicated test agents. The incubation buffer also contained 3-Isobutyl-1-methylxanthine (IMBX) (100 μM) to prevent the hydrolysis of cAMP by the cellular phosphodiesterase [3, 9, 18]. After incubation, the cells were washed with PBS and stored in RIPA buffer containing, HCl (100 mM) and IBMX (100 μM) for subsequent analysis of cyclic AMP, which was measured using a direct cAMP ELISA kit (AD-900-066) (Enzo life Sciences) according to the manufacturer’s instructions. The protein concentrations in the islet or INS-1 cell lysates were measured by a BCA kit (Nr 23,225) (Thermo Fisher Scientific Inc.). Gpr142 was downregulated in mouse islets using a cocktail of different Lenti-virus delivered shRNAs targeting the Gpr142 gene (sc-145707) (Santa Cruz, CA, USA) as we have described elsewhere for knockdown of other GPCRs [9, 39]. For downregulation of Gpr142 in rat INS-1832/13 cells, siRNAs (s180594) from Applied Biosystems (USA), with an appropriate scrambled control (4390846), were used according to the manufacturer’s recommendations. Briefly, the islets or INS-1832/13 cells were cultured in RPMI 1640 medium with the no addition of antibiotics during silencing period (36–42 h). Thereafter the medium was changed to a normal RPMI 1640 medium supplemented with the antibiotics and the islets or the INS-1 cells were cultured for an additional 6 h (recovery period) before being subjected to different experimental procedures. Validation of target-gene specific downregulation of Gpr142 expression was determined by qPCR as described above (cf Fig. 5 and Supplementary Fig. 5). For functional studies, shRNA-treated mouse islets or siRNA-treated INS-1832/13 cells (with 90% confluency in a 24-well plate) were washed and cultured for an additional 6 h after transfection to allow for recovery. The islets or INS-1832/13 cells were then washed again and pre-incubated for 30 min at 37 °C in KRB with 1 mM glucose (islets) or 120 min at 37 °C in HBSS containing 2.8 mM glucose (INS-1832/13 cells). After pre-incubation, the buffer was changed and islets or INS-1832/13 cells were incubated at the indicated test conditions for 60 min at 37 °C. For islet experiments, incubation vials containing 12 islets in 1.0 ml of buffer solution were gassed with 95% O2–5% CO2 to obtain constant pH and oxygenation. All islet incubations were performed in an incubation box shaken at 30 cycles/min. The incubation volume for INS-1832/13 cells (24-well palate) was 500 ul. Immediately after incubation, an aliquot of the medium was removed and frozen for subsequent assay of the released and cellular content of insulin. The insulin was measured using Rat Insulin ELISA kit (Cat# 10-1145), Mercodia (Uppsala, Sweden). The data were presented as the % of released insulin/total insulin per mg protein. The protein concentrations in the samples were measured by a BCA kit (Nr 23225) (Thermo Fisher Scientific Inc.). Bio-Plex multiplex technology was used to quantify the released cytokine levels for interleukin (IL)-1β, IL-12(p70), IFNγ, TNFα, and MCP-1 (Cat# MCYTOMAG-70K) (Merck Millipore). Analyses were performed according to instructions from the manufacturer. Due to very low levels of released cytokines in absence of any inflammatory stimulus, an undetectable level in each group was considered as 0. The values were normalized to the amount of islet proteins in each sample. INS-1832/13 cells were homogenized in ice-cold RIPA buffer and kept shaking on ice for 30 min. Extracted total protein content from homogenized INS-1832/13 cells was measured by Pierce BCA Protein Assay Kit (Thermo Scientific). Homogenates samples representing 30 μg of protein from scramble control (Scr) or Gpr142-KD INS-1832/13 cells were electrophoresed on 7.5% SDS-polyacrylamide gel (Bio-Rad, Hercules, CA, USA). After electrophoresis, proteins were transferred to a nitrocellulose membrane (Bio-Rad). The membrane was blocked in LS-buffer (10 mmol/l Tris, pH 7.4, 100 mmol/l NaCl, 0.1% Tween-20) containing 5% non-fat dry milk powder for 40 min at 37 °C. Subsequently, the membranes were incubated overnight, with the same GPR142 antibody used for the confocal experiments, (1:250) at 4 °C. After washing (three times) in LS-buffer the membrane was finally incubated with a horseradish peroxidase-conjugated anti-rabbit antibody (1:500) (Bio-Rad, Hercules, CA, USA). Detection of β-actin was with rabbit-anti-β-actin (Cat# A5441) (Sigma, USA) and secondary anti-rabbit antibody (1:1000). Immunoreactivity was detected using an enhanced chemiluminescence reaction (Pierce, Rockford, IL, USA). The blots were scanned with ChemiDoc™ MP Imaging System (Bio-Rad) and bands corresponding to the 50-kDa (protein marker) were identified as Gpr142 protein. The results were quantified by densitometric analysis of the band using the Bio-Rad software Image Lab (5.2.1, BioRad). A typical Western blot image of entire gel, performed on the homogenates from two scrambled controls and two Gpr142-KD INS-1 cells is shown in supplementary Fig. 3. INS-1832/13 cells were seeded at 10000 cells/well into 48-well plates in RPMI1640 medium (Life Technologies) with GlutaMaxTM (Gibco, USA) containing 11,1 mmol/l glucose and supplemented with 15% fetal calf serum, 50 μg/L streptomycin (Gibco), 75 mg/l penicillin sulphate (Gibco), and 5 μl/ml β-mercaptoethanol (Sigma). Thereafter, the cells were washed and transfected with siRNAs targeting Gpr142 as described above. After transfection (36 h) and a recovery period (6 h), the medium was changed and the cells were cultured for additional 72 h in normal RPMI 1640 culture medium at 37 °C with 5% ambient CO2. The cells (in individual wells) were then harvested by trypsination and counted using a Bürcker chamber . The reductive capacity of cells was measured on INS-1 cells when the INS-1 cells were subjected to 5 or 20 mM glucose for 72 h in the absence or presence of test agents or after downregulation of Gpr142. Measurement of reductive capacity was performed using the MTS reagent kit (Cat# G3580) according to the manufacturer’s instructions (Promega). Apoptosis was measured with the Cell Death Kit (Roche Diagnostics), which quantifies the appearance of cytosolic nucleosomes. The structural illustration of L-tryptophan, L-phenylalanine, and GPR142 agonists was performed by using ACD/3D Viewer (http://www.acdlabs.com/). Results are expressed as means ± SEM and probability levels of random differences were determined by Student’s t test or where applicable by analysis of variance followed by Tukey-Kramer’s multiple comparisons test. Figure 1 shows an immunohistochemical image of the Gpr142 expression pattern in isolated mouse pancreatic islet as determined by confocal microscopy with co-staining with insulin, glucagon and somatostatin. As shown, Gpr142 is abundantly expressed in the insulin-producing β-cells (A-C) although a similar expression level could be observed in only certain population of glucagon- and somatostatin-positive cells (G-I and J-L). The pixel intensity analysis of Gpr142 expressing β-, α-, and δ-cells within islets (confirmed by randomly chosen area in islets) showed that Gpr142 were significantly more expressed in β-cells (Fig. 1M). A closely related (both sequentially and structurally) homologous to Gpr142, i.e., Gpr139, which also shares the same endogenic ligands (the essential amino acids L-tryptophan and L-phenylalanine) exerts its effect by activating the cAMP/PKA system . We next studied the influence of two recently characterized and selective GPR142 agonists (Supplementary Fig. 1), structurally distinct from L-tryptophan and L-phenylalanine) [19, 34], on glucose-stimulated insulin secretion (GSIS) using INS-1832/13 cells. As illustrated in Fig. 2, both Gpr142 agonists (compound 33 and compound A) potentiated GSIS with concomitant increase in cellular cAMP content in control (Fig. 2a, c) but not in Gpr142-KD INS-1832/13 cells (Fig. 2b, d). Addition of non-metabolizable cAMP analogue (Bt2-cAMP) to the incubation media potentiated GSIS to the same extent both in the control and Gpr142-KD INS-1832/13 cells (Fig. 2e, f). To distinguish between the two possible downstream signaling pathways (cAMP/PKA and PLC/PKC), important for GPCR-mediated potentiation of GSIS, the specific inhibition of either of these pathways on the Gpr142 evoked potentiation of GSIS was investigated. As seen in Fig. 3, inhibition of cAMP/PKA pathway by the specific inhibitors of PKA (Myr-PKI) and Epac (ESI-05) markedly attenuated the impact of Gpr142 agonist (compound 33) on potentiation of GSIS (16.7 mM) while the inhibition of PLC pathway (U-73122) was less efficient. In the following experiment, we studied the functional impact of Gpr142-KD on the mouse islets and found that a marked increase in the release of MCP-1, IFNγ, and TNFα during 6 h recovery period after Gpr142-KD (Fig. 4a). Our results showed a marked increase in MCP-1, INFg, and TNFa in culture medium upon Gpr142-KD while the IL-1β release did not reach significant level in Gpr142-KD compared to control islets (Fig. 4a). Subsequent incubation of islets showed that while Gpr142-KD is associated with a slightly negative impact on GSIS (P = 0.05), the effects of the GPR142 selective agonist on GSIS was completely abolished (Fig. 4b). Interestingly, analysis of isolated human islet transcriptomes revealed an increased expression of only MCP-1 transcript in islets from donors with impaired glucose tolerance (IGT) or T2D (Supplementary Fig. 4). Since Gpr142 was abundantly expressed in β-cells with a marked impact on the GSIS, we performed Gpr142-KD in INS-1832/13 cells and compared the expression level of Gpr142 to several other Gpcrs, i.e., Gpcrs with Gq/o (Ffar1, Ffar2, and Ffar3) or Gpcrs with Gs-coupling (Gpr56) reportedly impacting at least in part, different down-stream signaling pathway [9, 27]. As the release of cytokines was increased upon Gpr143-KD, we also measured the expression of Tlr5 and Tlr7 two receptors involved in mediating inflammatory signals in pancreatic β-cells . Such a measurement would reveal the impact of Gpr142-KD on the expression of other Gpcrs with distinct signaling pathway. As shown in Fig. 5, the reduction in Gpr142 mRNA was also reflected in a reduced Gpr142 protein upon Gpr142-KD (Supplementary Fig. 4). 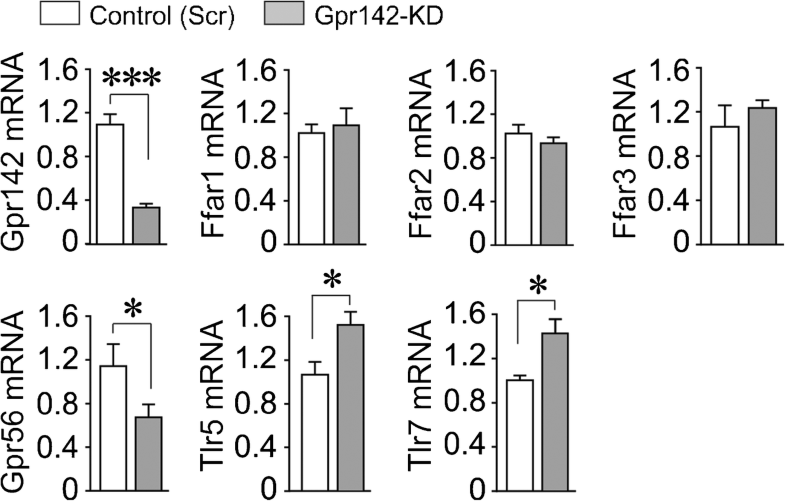 Although the expression of Ffar1, Ffar2, and Ffar3 at mRNA level was not influenced by Gpr142-KD, the expression of Gpr56 was reduced while the expression of Tlr5 and Tlr7 were increased (Fig. 5). Furthermore, we also investigated the impact of Gpr142-KD on several intracellular signaling path such as transcriptional factors utmost important for the maintenance of normal insulin-producing β-cell function. As shown in Fig. 5, Gpr142-KD was accompanied by a reduced mRNA expression of Pdx1 and Pax6 while NFkB, Chrebp, and Txnip, as well as Rho A and NOS2 (iNOS) mRNA levels, were increased. Gpr142-KD did not influence NOS1 (ncNOS) mRNA expression (Fig. 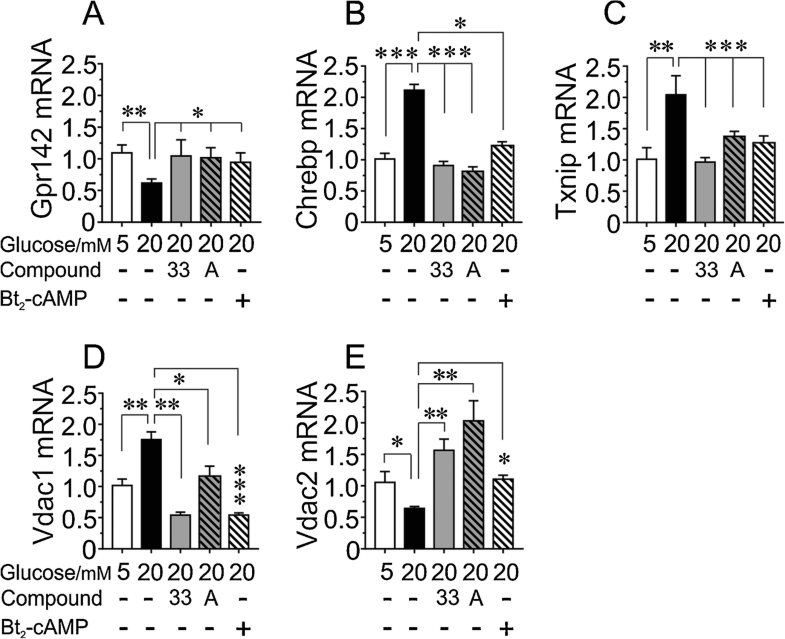 6), while it increased mitochondrial Vdac1 mRNA while Vdac2 mRNA expression was reduced (Fig. 6). Since chronic hyperglycemia contributes to β-cell decompensation (glucotoxicity), we next investigated the impact of prolonged exposure of INS-1832/13 cells to high concentration of glucose (20 mM) in the presence or absence of Gpr142 agonists or non-metabolized cAMP analogue (Bt2-cAMP) for 72 h on the Gpr142, Chrebp, Txnip, Vdac1, and Vdac2 mRNA expression. The effect was compared to the basal and physiological concentration of glucose (5 mM). As shown in Fig. 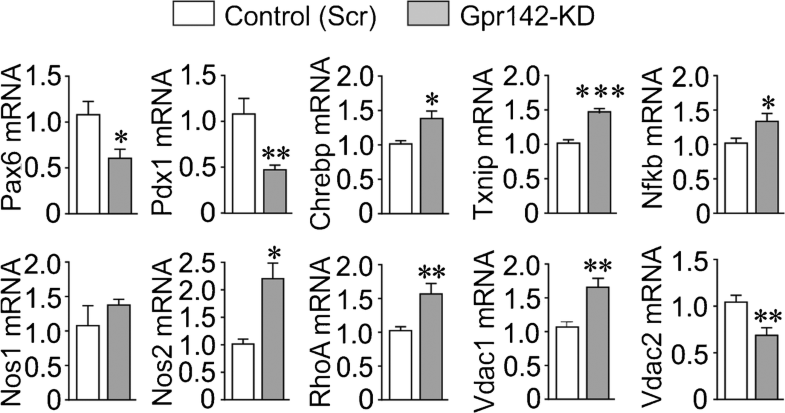 7a–e, culture of INS-1 cells at high glucose reduced the expression of Gpr142 while the expression of Chrebp, Txnip, and Vdac1 mRNA was increased. The Vdac2 mRNA was suppressed. This effect of high glucose was abolished when either of GPR142 selective agonists or Bt2-cAM were present during culture period (Fig. 7a–e). Since chronic exposure of INS-1832/13 cells to high glucose is associated with a reduced reductive capacity and an increased apoptosis , we further investigated the consequence of Gpr142-KD on the cell viability by measuring cellular reductive capacity (an indirect measurement of mitochondrial function) and apoptosis. The suppressive effect of high glucose (20 mM) on the reductive capacity of the INS-1 cells (measured as the formation of formazan from tetrazolium salt, MTS assay), was prevented by GPR142 agonist and Bt2-cAMP in scramble control INS-1 cells (Fig. 8a). Gpr142-KD, however, resulted in an attenuated reductive capacity already at normal glucose levels (5 mM), which was further reduced in the presence of higher glucose concentration (20 mM) (Fig. 8a). While GPR142 agonist lacked the incremental impact on the cell viability in Gpr142-KD cells, Bt2-cAMP completely prevented the reduction in cell viability induced by Gpr142-KD (Fig. 8). Next, the impact of Gpr142-KD on cell apoptosis was also studied by measuring cytoplasmic nucleosomes in INS-1832/13 after exposure to high glucose (20 mM) compared to basal glucose level (5 mM). 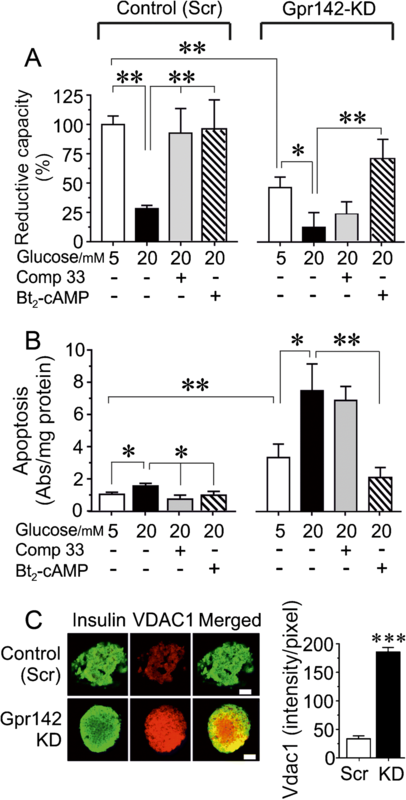 While exposure to 20 compared to 5 mM glucose for 72 h modestly increased apoptosis, presence of the GPR142 agonist or Bt2-cAMP in the culture medium prevented high glucose-induced apoptosis almost to the same extent in scramble control INS-1 cells (Fig. 8b). Gpr142-KD, however, was associated with a marked increase in cell apoptosis at 5 mM glucose and further increased apoptosis when INS-1832/13 cells were cultured at 20 mM glucose (Fig. 8b). Compound 33 did not suppress glucose-induced apoptosis in Gpr142-KD cells while Bt2-cAMP was still efficient in preventing apoptosis in INS-1 cells (Fig. 8b). The impact of Gpr142-KD on the INS-1832/13 cell proliferation was also investigated by counting the actual cell number, which is a reliable assay method that has been shown recently . As shown in Supplementary Fig. 6, there was no significant reduction in total number of INS-1832/13 cells as counted directly after Gpr142-KD procedure (at the 36th hour). Since increased expression of VDAC1 leads to β-cell dysfunction and apoptosis in both human and rodent β-cells , and since Gpr142-KD was associated with the increased expression of Vdac1 transcript, we next investigated the impact of Gpr142-KD on Vdac1 protein expression in mouse islets by confocal microscopy. As illustrated in Fig. 8c, Gpr142-KD indeed increased Vdac1 protein expression as calculated by intensity analysis of Vdac1 in the islets. Based on the present results and our previous publications [1, 2, 3, 4, 5, 8, 37], a schematic image of the generated hypothesis is illustrated in Fig. 9. Functional characterization of GPCRs that are currently not targeted by drugs may offer novel approaches to treat human diseases. Recently published data from Gpr142 knockout mice have highlighted the impact of Gpr142 activation on insulin secretion and therefore GPR142 agonists were developed as novel and potential therapeutic drug in the treatment of human T2D [19, 34]. In the current study, we show that in addition to pancreatic β-cells, Gpr142 is also expressed in certain populations of glucagon producing α-cells and somatostatin producing δ-cells in mouse pancreatic islets. The apparent lack of Gpr14 expression by a certain category of α-cells or δ-cells can be attributed to the functional difference of these cells within the islets. These observations are thus in good agreement with the previous reports describing the functional heterogeneity of islet cells. . The ratio of Gpr142 expressing cells in our immunohistochemically and confocal microscopy images further confirmed that Gpr142 protein is mainly expressed in β-cells of the islets, although the co-localization in a minor populations of α- and δ-cells that cannot be neglected. Whether this expression pattern in α- and δ-cells could have any major impact on the systemic function of these cells merits further investigation. In the present study, we focused on the β-cell function and based on the different expression pattern of Gpr142 in the islet cells, we believe that GPR142 selective agonists may favorably impact β-cell function rather than α- or δ-cells. Here, we also present evidence that GPR142 activation by selective compounds acutely potentiates GSIS by increasing cellular levels of cAMP, a signaling messenger molecule with beneficial effect on β-cell function. Although signaling via the activation of Gq in HEK293 cells has been documented for Gpr142 [19, 34], we here demonstrate an additional signaling pathway via Gs for Gpr142 activation. The reason for this rather divergent mechanistic behavior for the same receptor in two different cell types is difficult to explain but it should be kept in mind that HEK293 cells differ in many aspects from β-cells. Moreover, the forced expression of GPR142 in the HEK293 cells could consequently interfere with the expression of other GPCRs or signaling path [16, 32]. 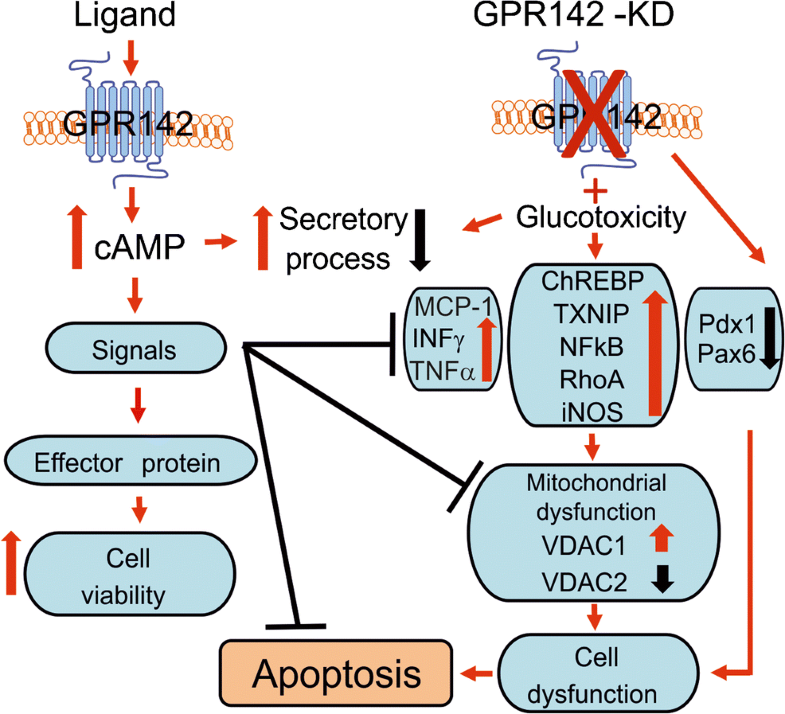 The apparent impact on cAMP generation as down-stream signaling cascade for Gpr142 activating agonists is further supported by the lack of such an effect in Gpr142-KD INS-1 cells. In addition, our experiments with specific blockers of PKA/Epac confirms that the positive impact of Gpr142 agonist on GSIS is exerted through the cAMP/PKA/Epac pathway as selective inhibition of PKA/Epac totally inhibits the effect of Gpr142 agonist on the potentiation of insulin secretion. This assumption is further strengthened by the fact that specific inhibition of PLC is comparatively less noticeable. Although our data clearly speak in the favor of cAMP/PKA/Epac pathway being much more superior to that of PLC pathway concerning the selective Gpr142 activation, it does, however, not exclude the possible importance of the PLC/PKC pathway in mediating a modest effect of Gpr142 on potentiation of insulin release in rodent β-cells. Concerning the integrated activation of a two different messenger system by GPR142, it should be mentioned that such an integrated signaling pathway has been shown for other GPCRs [18, 27]. If the indicated response of either of these two pathways upon receptor activation is more intense and superior to the other, could also depend on the experimental conditions. One such experimental condition is the ambient glucose level, since, as we previously reported, sub-stimulatory and stimulatory glucose concentrations are differentially impacting cAMP generation [3, 18, 22]. Moreover, it is also well-known that a stimulatory glucose level is capable of increasing phosphatidyl inositol hydrolysis and the production of inositol 1,4,5-trisphosphate (IP3) leading to elevated [Ca2+]i level, in addition to its well-stablished impact on the Ca2+ influx via voltage-gated Ca2+ channel [21, 29]. Similar to islets from T2D organ donors, exhibiting β-cell dysfunction and increased expression of pro-inflammatory cytokines, exposure of non-diabetic islets to high glucose concentrations (24–72 h) results in an increased expression of pro-inflammatory signals that negatively impact β-cell function [3, 7, 11]. The data presented here show that the Gpr142 expression in islets is important to maintain a fully functioning β-cell machinery since Gpr142-KD is associated with the release of a panel of cytokines that are mediators of an inflammatory response . Here, we also show that in the absence of any immunogenic stimuli, Gpr142-KD is associated with the release of TNFα and IFNγ and MCP-1 from islet cells. The mentioned cytokines have a negative impact on β-cell function [17, 25] and as such this could be an additional factor in the attenuation of β-cell function seen after Gpr142-KD. Although available RNA sequencing data from isolated human pancreatic islets revealed very low and hardly detectable transcript levels of the TNFα, IFNγ, and IL-1β, we found a positive correlation for MCP-1 transcript with the average blood glucose level (glycated hemoglobin A1c, HbA1c) in human. This indicates the importance of MCP-1 as one of the mediator of β-cell dysfunction in islets from diabetic donors (P = 0.039) . Notably, our data also show that receptors, i.e., Ffar1 (Gpr40), Ffar2 (Gpr43), or Ffar3 (Gpr41), which are not interacting with the cAMP/PKA signaling system [16, 27], are not influenced by Gpr142-KD. Interestingly, our data reveals a regulatory connection between Gpr142 and Gpr56 expression since Gpr142-KD is associated with a reduced expression of Gpr56. Gpr56 is a GPCR with a tonic regulatory impact on the cAMP/PKA system and β-cell viability in both human and rodent islets . In contrast to the mentioned receptors, our data showed an increased expression of Tlr5 and TlrR7 in Gpr142-KD cells. This could be either a direct effect of Gpr42-KD or the consequence of the reduced cAMP level, evoked by the ablation of Gpr142 in INS-1832/13 cells. Since activation of cAMP/PKA system exerts a regulatory impact on the expression of a vast majority of proteins in β-cells [9, 22], it tempt to speculate that the reduced level of cAMP in Gpr142-KD cells could explain the observed results. It has been reported that an increased expression of Tlr5 and Tlr7 is associated with disturbed insulin secretion and glucotoxicity as well as the presence of inflammatory cytokines during culture of isolated pancreatic islets increases the Tlr5 and Tlr7 expression . 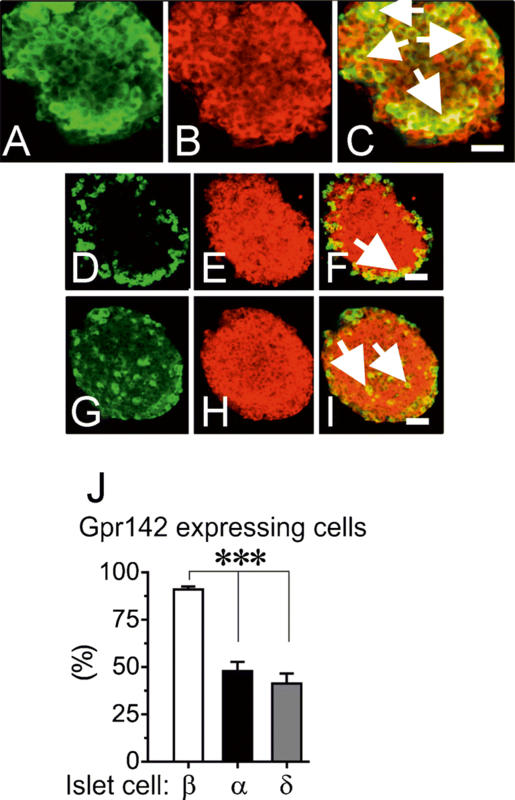 The importance of Gpr142 for β-cell function is further substantiated by the finding that the knockdown of Gpr142 in β-cells is associated with reduced expression of Pdx1 and Pax6, two transcriptional factors that are very important for the development and maintenance of normal β-cell function . Thus, low expression level of Pdx1 and Pax6 upon Gpr142-KD can explain, at least in part, the reduced β-cell viability and dysfunctionality. These findings are thus in good agreement with previous reports showing that the heterozygous Pax6 mutations are associated with glucose intolerant and susceptibility to diabetes in both human and rodents . Moreover, we also found that Gpr142-KD caused increased expression of Chrebp, Txnip, NFkB, RhoA, and NOS2 (iNOS), all of which are associated with β-cell dysfunction in both human and rodents [9, 22]. In the case of RhoA activation, a recent study has shown that it inhibits the growth and repair of neural cells while inhibition of RhoA and its down-stream pathway usually results in an improved re-myelination rate of neuronal cells [6, 38]. Our data also illustrate that Gpr142-KD markedly increases the expression of Vdac1 while reducing Vdac2 expression. Both VDAC1 and VDAC2 are mitochondrial gatekeeper allowing the flux of important metabolites and ATP to the cytoplasm . Altered expression of VDAC1/VDAC2 is associated with mitochondrial dysfunction [1, 31, 39] indicating that ablation of Gpr142 would consequently impact mitochondrial function in the β-cell. This is further confirmed by our observation of reduced cell viability (an impaired generation of mitochondrial reductive capacity) upon Gpr142-KD. Since activation of cAMP and downstream cascade has anti-apoptotic effect [9, 22], a reasonable explanation for the increase apoptosis upon Gpr142-KD could be the reduced level of cAMP concomitant with a disturbed mitochondrial function. Our data also show that presence of GPR142 agonists during long-term of INS-1832/13 cells suppresses the hyperglycemic-induced expression of transcriptional signals associated with β-cell dysfunction [25, 30, 39], which are similar to the effects seen in the presence of non-metabolizable cAMP analogues, i.e., Bt2-cAMP. 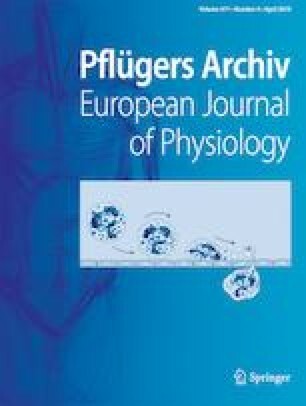 Compared to previously reported anti-apoptotic and beneficial effect of Bt2-cAMP on the β-cell  is our findings that GPR142 agonists also could efficiently prevent pancreatic β-cell dysfunction under pathophysiological conditions such as hyperglycemia and could therefore be attractive therapeutic agents in the treatment of T2D. It should be recalled that Bt2-cAMP and other cAMP elevating agents not only potentiate insulin secretion in a glucose-dependent manner but also enhance β-cell viability by preventing generation of apoptotic signals [3, 18, 22]. Since GLP-1 analogues or the Dipeptidyl peptidase-4 (DPP-4) inhibitors lack the long-lasting and satisfactory effect on the maintenance of β-cell function during pathophysiological conditions, [20, 28], this further substantiates an unmet need of a new a better class of antidiabetic drugs with impacts on the other receptors. The present data further supports the potential therapeutic concept of using GPR142 selective agonists in the design of future treatments for human T2D subjects. Furthermore, we show that sustained hyperglycemia causes a reduction in Gpr142 mRNA expression associating with a reduced GSIS, which was efficiently counteracted by GPR142 agonists and Bt2-cAMP indicative of the importance of cAMP in this regard. 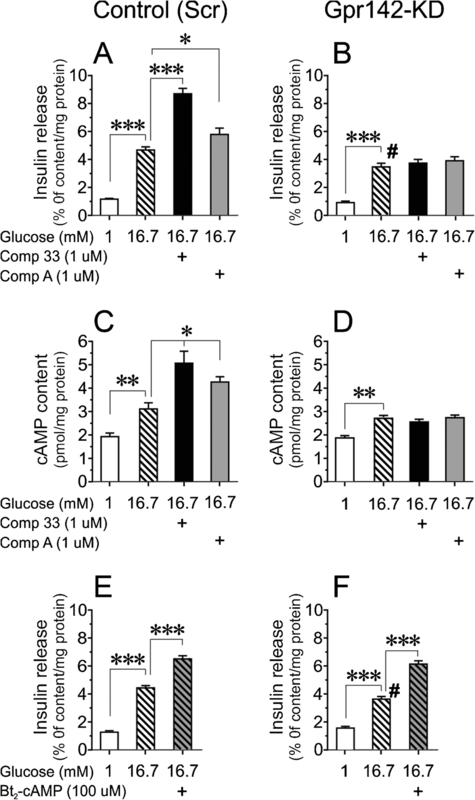 The suppressive impact of cAMP signaling path on the glucotoxicity-induced increased on the expression of Chrebp and Txnip, is in line with the previous reports of increased expression of these two transcriptional factors, in association with β-cell dysfunction in human T2D islets [1, 25, 39]. Since the cAMP pathway counteracts β-cell dysfunction, we believe that the cAMP generation with GPR142 agonist would be a plausible explanation of the suppression of Chrebp and Txnip. This hypothesis is further confirmed by the similar observation using non-metabolized cAMP analogue Bt2-cAMP. Our data also indicates that the altered Vdac1/Vdac2 expression is, at least in part, associated with a decreased cellular reductive capacity reflecting impaired mitochondrial function. Moreover, the increased Vdac1 expression induced by hyperglycemia is efficiently prevented by selective activation of Gpr142 or by Bt2-cAMP, (non-metabolizable cAMP analogue) further implicating the role of cAMP in this respect. From present data, we conclude that the islet cAMP system is an even more important regulator of β-cell viability than previously anticipated. The beneficial effects of GPR142 agonists on β-cell viability, suppression of apoptotic signals, and the potentiation of GSIS are mediated, at least in part via generation of cAMP. Imposed and persisting hyperglycemia is associated with the increased expression of Chrebp and Tnxip, which could be efficiently counteracted by Gpr142 activation. A tonic activity of Gpr142 also appears to be important for the β-cell function as it is reflected by a causative link between Gpr142-KD and reduced cellular cAMP content concomitant with the altered mitochondrial VDAC1/VDAC2 expression, leading to β-cell dysfunction. Thus, GPR142 agonists could be a new therapeutic approach in the management of T2D, not only by potentiating GSIS but also by suppressing spontaneously progressed inflammatory signals in pancreatic islets and insulin-producing β-cells. We thank Britt-Marie Nilsson and Anna Maria Ramsay for skilled technical assistance. We are grateful to Dr. Hua Lin and Dr. Tianwei Ma from Lilly Research Laboratories for providing the Gpr142 agonists. This study was supported by grants from Diabetes & Wellness foundation, Mats Paulsson Foundation, Forget Foundation, Swedish Diabetes Foundation, Lund University Diabetes Centre (LUDC/EXODIAB/LUDC-IRC), and Öresund Diabetes Academy.